"Unten zK: der unabhängige Goldanalyst Koos Jansen, der schon seit längerem argumentiert und begründet, dass China etwa 1800-2000 Tonnen Gold p.a. nachfragt, wurde nun (zumindest mal für 2013) von berufener Stelle BESTÄTIGT. Und damit wurden zugleich die offiziellen aber seit Jahren manipulativ dubios niedrigen WGC-Zahlen (gut „1000 Tonnen“ für 2013) quasi offiziell „dementiert“. 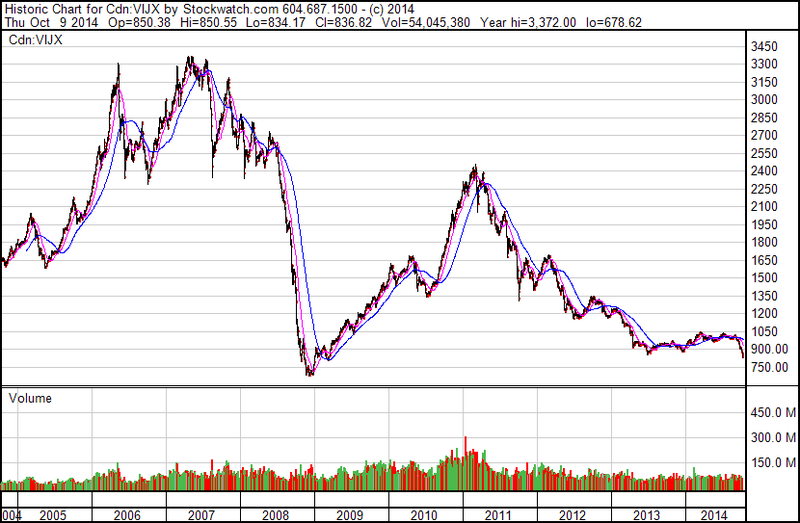 Der berufene Mund war Xu Luode, Chairman der Shanghai Gold Exchange (SGE). In einer Rede schon im Juni 2014 – aber von Koos jetzt verbreitet. Siehe unten Link. Wohlgemerkt: Das ist nur CHINAs Nachfrage. Der Rest der Welt inklusive Indien (geschätzte fast 1000 Tonnen Nachfrage p.a.) kann sich somit um –je nach Annahmen zum Minenoutput und Recycling– weitere 1000-2000 Tonnen Goldangebot p.a. kloppen. Ganz „logisch“, dass bei dieser physischen Marktlage der Goldpreis 2013 stark abfiel, nicht…"
This is the final blow for the ones who still can't comprehend, after all evidence presented, the amount of Chinese non-government gold demand in 2013. At the LBMA forum in Singapore June 25, 2014, one of the keynote speakers was chairman of the Shanghai Gold Exchange (SGE) Xu Luode. In his speech he made a few very candid statements about Chinese consumer gold demand, that according to Xu reached 2,000 tonnes in 2013. In contrast to the Word Gold Council (WGC) that states Chinese gold demand was 1,066 tonnes in 2013. Xu's speech has now finally been translated and published, in the LBMA magazine The Alchemist #75. Data on China’s gold imports has not previously been made available to the public. However, gold has historically been imported through Hong Kong, and Hong Kong is highly transparent, disclosing details such as the number of tonnes of gold imported on a monthly basis. Last year, China imported 1,540 tonnes of gold. Such imports, together with the 430 tonnes of gold we produced ourselves, means that we have, in effect, supplied approximately 2,000 tonnes of gold last year. The 2,000 tonnes of gold were consumed by consumers in China. Of course, we all know that the Chinese ‘dama’ [middle-aged women] accounts for a significant proportion in purchasing gold. So last year, our gold exchange’s inventory reduced by nearly 2,200 tonnes, of which 200 tonnes was recycled gold. Additionally, it's very clear what kind of metric the SGE uses. Xu subtracts recycled gold from SGE withdrawals to measure consumer demand, which equals newly added gold (import + mine = 1968t) to the private gold holdings of Chinese citizens. Confirming the Chinese gold market with the SGE at its core, is designed by the PBOC to track the quality and quantity of gold held in non-government reserves. By flipping the variables in the formula I was able to estimate Chinese import in 2013 (SGE withdrawals - mine - scrap = import) by an error margin of only 2.6 %. Year to date SGE withdrawals account for 1425 tonnes, of which I estimate 855 tonnes was imported. Western media are still focusing on the amount of gold Hong Kong net exports to China, which is dropping like a brick, as a proxy for Chinese imports. However, this data has dramatically lost its significance as China has openly announced it imports more gold directly into cities like Shanghai and Beijing. This was clearly communicated, see the next video from 1:14. The Shanghai Customs department published a press release September 19 on their website saying they imported 48 batches of gold in the first eight months of this year worth $15 billion dollars, which roughly translates to 380 tonnes. Unfortunately the article does not say where this gold came from, but it very well supports the fact China continues to import large amounts of bullion, which can be seen by strong SGE withdrawal data. in September import has increased 30 % m/m. The strange thing is, there were many industry professionals and journalists in the room when Xu spoke at the LBMA forum (click for the delegate list), but only one of them rushed to his laptop during the break to share the content of Xu's speech, paramount information. He sent me an email that I immediately published for the whole world to read. This person was my friend and CEO of BullionStar, Torgny Persson. However, there still hasn't been a single mainstream news outlet that has covered the immense discrepancy between the Chinese demand numbers from the WGC and the SGE. I would like to express my deepest concern about how the mainstream media is covering the (Chinese) gold market. Xu stated, at the most prominent precious metals forum in the world, Chinese gold demand reached 2,000 tonnes. By the way, later on in his speech he repeated it twice! Earlier, I have reported on the data that physical gold consumption in China’s gold market has, in effect, reached more than 2,000 tonnes last year. All of you here are experts in this industry and are very clear about the percentage accounted for by these 2,000 tonnes of physical gold in the global market. How could the press have missed this? A difference of 1,000 tonnes in Chinese non-government gold demand. The first publication I posted about what Torgny emailed me from the LBMA forum can be found here. In the comment section underneath there is a conversation with Bron Suchecki who also listened to Xu's speech, however, he (and one other journalist) couldn't recall Xu saying Chinese demand hit 2,000 tonnes. Fortunately we know have it in black and white; Xu said it three times and other SGE officials have made the same statements. I would recommend everyone to read the entire speech from Xu (here). Copyright information: BullionStar permits you to copy and publicize blog posts or quotes and charts from blog posts provided that a link to the blog post's URL or to https://www.bullionstar.com is included in your introduction of the blog post together with the name BullionStar. The link must be taret="_blank" without rel="nofollow". All other rights are reserved. BullionStar reserves the right to withdraw the permission to copy content for any or all websites at any time. I had the pleasure of attending the 2014 Subscriber Investment Summit in Vancouver today. It was an insightful gathering of resource executives, investors, and newsletter writers. There was even a billionaire or two in the room and naturally plenty of “corporate pillow talk” (credit to Keith Schaefer for the phrase). The mood of the conference was generally positive, albeit tame in terms of the overall level of optimism on the sector. In fact, Eric Coffin of HRA Advisories stated that “300 to 400 companies still need to leave the space (go bust)” before the market really lifts off. Aveda Transporation and Energy Services Inc. (AVE.V) gave one of the better presentations. Aveda has quickly become the best in class transportation and energy services provider in North America. At today’s market closing Aveda shares are trading at 65% of book value and the company is profitable to boot. Nathan Weiss of Unit Economics delivered a power packed presentation which included an analysis of natural gas price sensitivity. Nathan sees $3.50 as the equilibrium price for natural gas with dips below $3 being supported by coal-to-gas switching by power plants and moves above $4 being met with a deluge of supply from producers. Pure Gold (PGM.V) is a unique way to play the Red Lake Gold District via the Madsen Project which has existing mining infrastructure in place, including a 500 tonne per day mill, a 1,275 metre deep shaft, 24 levels of underground workings, a headframe, and a permitted tailings management facility, all connected to roads and power. The company has been conducting a summer drill program, the first results of which should be public within 2-3 weeks. Excelsior Mining (MIN.V) is a very interesting “in-situ” copper play in Arizona – $1.37/lb all-in cost with potential for full remediation of mine site with little environmental issues. 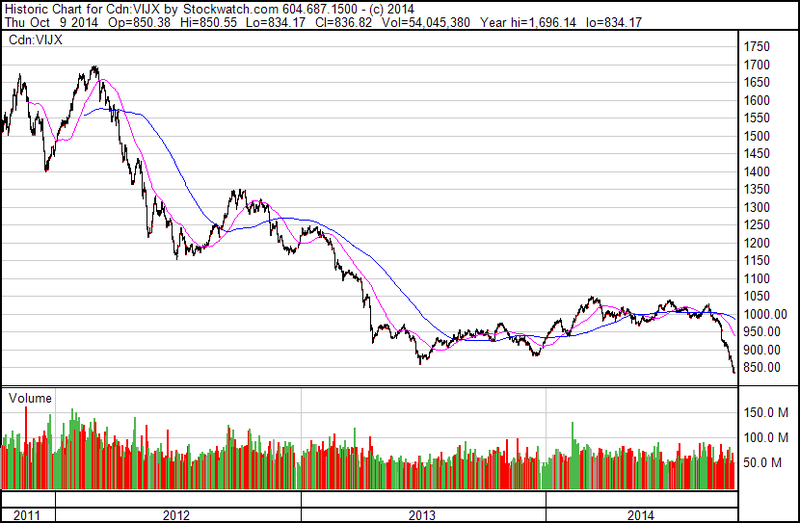 I should add that the chart has held up quite well during the brutal tape of the past 6 weeks in the mining space. Red Eagle Mining (RD.V) CEO Ian Slater presented a straightforward path to production and free cash flow within two years. We would also add that the company’s stock has done well in a difficult market for juniors, particularly those with exposure to Colombia. Nolan Watson of Sandstorm Gold (SSL.TO) talked a bit about gold as money and confessed that he carries a one ounce gold coin in his wallet to remind himself of that fact. Sandstorm is committed to becoming the gold sector’s best risk adjusted, cash flow investment vehicle. With $165 million in available capital for acquisitions I have no doubt that Nolan will be able to find some very attractive deals in the current depressed environment of the gold space. Eric Coffin of HRA Advisories gave an insightful macro market roundup and it almost felt as if he had read my mind. 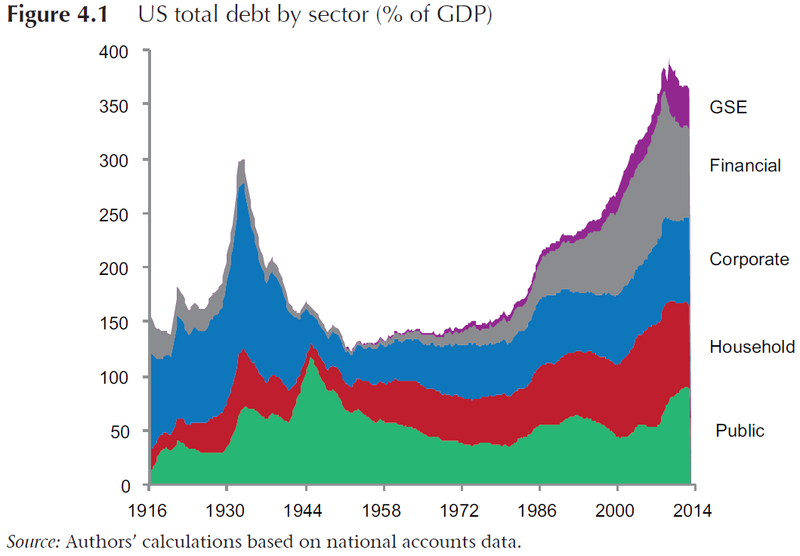 However, Eric believes that if the S&P 500 goes into a deep correction gold will also suffer. I believe that gold will likely benefit under such a scenario as the Fed and other major global central banks will undoubtedly move back into their roles of stoking the liquidity spigots into full throttle. During the final Q&A portion of the conference I had the opportunity to ask the assembled newsletter writers “What would you do if you were handed $1,000,000 to invest right now?” – the answers were very similar with high cash levels being favored. Nathan added that he would short the natural gas ETF (UNG) and Tommy offered that he would begin legging into the likes of Ivanhoe Mines (IVN.T), NGex Resources (NGX.TO), and Torex Gold (TXG.TO). I would like to thank Katy and her team who were top notch in their organization and planning of the conference. The Pan Pacific Vancouver was an exceptional venue and I look forward to returning next year, hopefully amid a much more cheerful market backdrop for the junior resource space. Trotz sehr anspruchsvoller Marktlage im Goldminensektor kämpft sich der aussichtsreiche Goldexplorer erfolgreich voran. Die Explorations- und Bohrprogramme bei Gold Standard Ventures (TSX-V:GSV) laufen erneut auf Hochtouren und schon bald werden die ersten Ergebnisse in den Laboren ausgewertet sein. Die fundamentale Unterbewertung der Firma, die zu den aussichtsreichen Gold-Explorern im ruhmreichsten Goldminenstaat in Nordamerika gehört, spricht immer mehr antizyklische Käufer an. Vor kurzer Zeit haben auch die Analysten von H.C. Wainwright & Co. das Coverage für Gold Standard Ventures gestartet und sehen ein erstes Kursziel von 1,75 CAD vor. Die Experten von H.C. Wainright & Co. untermauern ihre Einschätzungen und das Kursziel insbesondere mit dem großen Potential auf near-term Cashflow. Das relativ unkomplizierte Haupt-Goldvorkommen kann aufgrund seiner vorteilhaften Eigenschaften (geringe Tiefe, ordentliche Goldgehalte, Oxid-Gold, sehr gute Infrastrukturanbindungen etc.) zielführend den Weg zur Produktion in den nächsten 36 Monaten meistern. Weiter liegen im Hinblick auf die privilegierte Lage auch keine bedeutenden Umwelt- und Genehmigungsrisiken vor. Ein ebenfalls wichtiger Punkt. Awde erhöht durch die letzten Insider-Transaktionen seine Anteile an Gold Standard auf knapp 900.000 Aktien. Weitere rund 1,4 Mio. Aktienoptionen hält Awde zusätzlich. Die gesamte Insider-Quote kann sich ebenfalls sehen lassen. So liegen mehr als 15% der ausstehenden Aktien bei den Firmen-Verantwortlichen. Die aktuelle Holdings-Quote von Institutionellen steht bei 50%. Das Expertenteam von Miningscout war von wenigen Tagen in Nevada und hat sich die jüngsten Fortschritte auf den Gold-Liegenschaften von Gold Standard Ventures live angeschaut. Hier der Link zum informativen Site Visit Report mit zahlreichen wertvollen Hintergrundinformationen und visuellen Einblicken: Auf den Spuren des modernen Goldrausch – Besuch bei Gold Standard Ventures in Nevada. Die Arbeitsprogramme im ruhmreichsten Goldminen-Bezirk in Nordamerika laufen bei der kanadischen Juniorgesellschaft auf Hochtouren. Mit der Vorlage des ersten, qualitativen Ressourcen-Reports, der starke Ergebnisse lieferte, stellt die Junior-Gesellschaft die Weichen für die Zukunft..
Seit Anfang September geht der wichtigste Small Cap Index für Rohstoff-, Minen- und Energiewerte in den freien Fall über. Grund für den Ausverkauf im TSX-Venture (TSX-V) ist der massive Sell-Off, der querbeet durch die Rohstoffbranche zu spüren ist. So fielen bspw. Erdöl, Eisenerz, Kohle, Silber und Pottasche auf neue Mehrjahrestiefstände zurück und Panikverkäufe erreichten nicht nur die Goldminenbranche.. But but but the Shale Revolution!!?? The National Day Golden Week, a one week holiday in China mainland, yes, the Chinese name their holidays golden, began on October 1 this year, so that's when trading stopped on the Shanghai Gold Exchange (SGE) and Shanghai Futures Exchange (SHFE). This means I only have half a story for you today. The latest withdrawal data from the SGE always lags one week and is thus from week 39 (September 22- 26), other data from the SGE and SHFE covers week 40, which in this case covers only 2 days (September 29 - 30). Let's begin with the SGE. In week 39 (September 22 - 26) the amount of gold withdrawn from the SGE vaults accounted for 46 tonnes. Quite a strong week if one bears in mind this number equals wholesale demand of gold in China mainland. Year to date 1427 tonnes have been withdrawn from the SGE vaults. Blue is weekly withdrawals in Kg's, green is withdrawals year to date in Kg's. 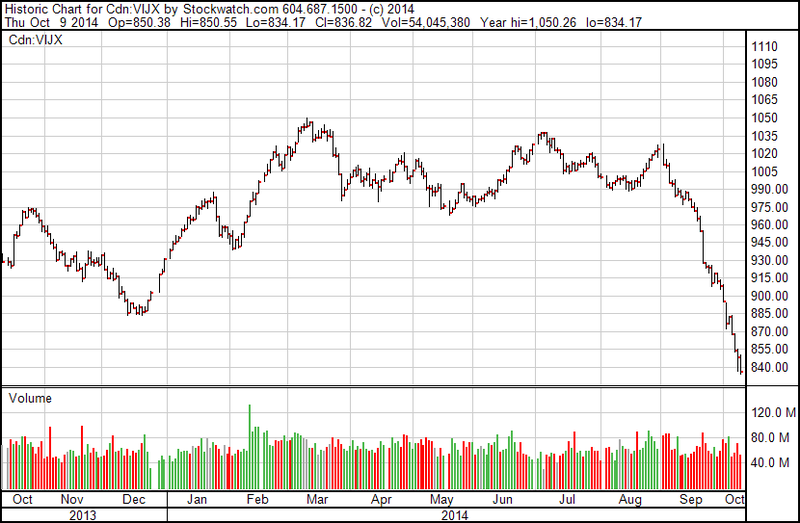 Until the SGE will disclose withdrawals numbers separate I'm forced to adjust my numbers and charts. The SGEI was launched in week 38. From then on I will subtract all SGEI trades, single-sided, from withdrawal numbers as, though we don't know for sure, the SGEI buyers could have opted for withdrawal in the Shanghai FTZ. Last but not least let's have a look at what happened in the Chinese silver market on the last trading days (September 29, 30). Silver on the SHFE is still trading in backwardation - since August 6. SHFE inventory increased by 18 % w/w to 94.9 tonnes! My guess is as long as the futures curve is in backwardation or won't turn to steep contango, inventory will remain around current levels. Inventory will increase if a steep contango curve pays to cash and carry the metal, or if the open interest rises significantly. The price of deferred silver in Shanghai excluding 17 % VAT traded at a discount of just under 4 % relative to London spot. Shanghai silver remains scarce. Lesenswerter Beitrag von CEO.CA mit Fokus auf einer aussichtsreichen Juniorfirma namens Aveda Transportation and Energy Services (TSX-V:AVE) - einem jungen Spieler im lukrativen und relativ krisenresistenten Servicebereich der Energiebranche in Nordamerika, die durch das Fracking einen enormen Boom erlebt. Aveda ist das neuste Venture des legendären Investors und Öltitans Dave Werklund, der mit seinen erfolgreichen Deals Milliardär und einer der einflussreichsten Geschäftsmänner in der Branche geworden ist. According to legend, during the great California and Klondike gold rushes, it was the service providers — those who sold pans and pickaxes — who made the most money, not the miners. Fast-forward to 2014 and the still-rising shale energy boom is moving the United States ever closer to energy independence. This means drilling activity is skyrocketing — and will continue to be heavy for years. Meet the Calgary-based energy billionaire planning his next fortune moving drilling rigs, rather than finding properties to use them on. He’s the driving force, you could say, behind an energy services company that is largely under the radar, and will be attending a conference I’m co-hosting Thursday afternoon in Vancouver (Details). Growing up on a farm in rural Alberta gave energy entrepreneur Dave Werklund a strong work ethic, core values and a “can-do,” problem-solving attitude. As a young man, he was a boots-on-the-ground “operations guy” who started out as a production manager for Shell. He leveraged values instilled on the farm and strong firsthand field experience into a career building businesses in the energy services sector. “I can generally recognize a real opportunity when I see it,” Werklund says. That’s an understatement, given the Calgary-based businessman’s track record. In 1984, Werklund founded a small oil waste treatment company called Canadian Crude Separators (CCS) with an initial investment of $50,000. The market cap was about $8 million. By the time he took CCS private in 2007 in the largest trust privatization in Canadian history, it had an enterprise value of more than $3.5 billion. CCS successor Tervita now does more than $5 billion in business annually..
Es wäre der mit Abstand größte Deal in der Minenbranche während der letzten Jahre. Noch viel größer als der Merger zwischen Glencore und Xstrata vor geraumer Zeit. 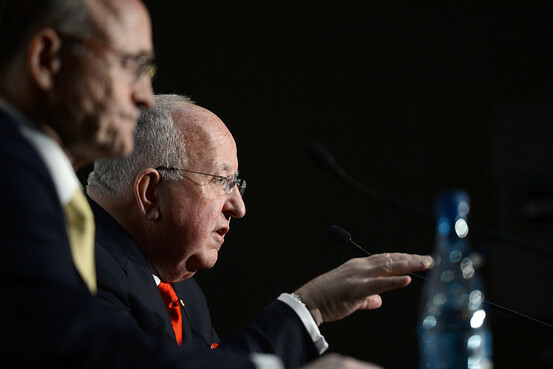 Doch der Rohstoffgigant Rio Tinto erteilt der kleineren Glencore/Xstrata zunächst eine Absage. Glasenberg wollte durch die Übernahme von Rio Tinto vor allem das Eisenerzgeschäft stark ausbauen - eine der ganz wenigen Rohstoffsektoren, in denen Glencore/Xstrata bis dato keine größere Rolle spielt. Eine feindliche Offerte schließt der Rohstoffkönig bis dahin noch aus. Im Hintergrund geht es natürlich um viel mehr als nur um Eisenerz. Es geht um die Vorherrschaft in der Minen- und Rohstoffbranche. Ein Merger zwischen Rio Tinto und Glencore würde viel mehr Konkurrenz für den größten Rohstoffkonzern der Welt, BHP Billiton, bedeuten. In jedem Fall kann man an dieser Stelle festhalten, dass das gestiegen Interesse an M&A-Transaktionen im Rohstoff-Sektor erneut ein Signal für eine Bodenbildung im Gesamtbild darstellen sollte. Vor allem im Hinblick auf die Historie. Der britisch-australische Bergbaukonzern Rio Tinto hat vor einigen Wochen eine Übernahmeofferte des Wettbewerbers Glencore GLNCY +0,52% verschmäht. Die Offerte war aber wohl nur der erste Schritt. Ob sich Rio Tinto dauerhaft zieren wird, ist ungewiss.. Informative, neue Grafik von Visual Capitalist, hier in groß einsehbar. Der gestrige Handelstag geht in die Geschichte ein. Noch nie war das Handelsvolumen in den größten Goldminen-ETFs höher. So wird die Zinserhöhung einmal mehr verschoben, nur dieses Mal in einer wesentlich direkteren und offensichtlicheren Form. Was für eine Farce. Und wer hätte es nur gedacht (Sarkasmus on), dass die amerikanische Wirtschaft eine Zinserhöhung nicht verkraften würde (lediglich eine symbolische) und die Dollar-Stärke gefährlich ist?! Folgend kommt es zu einer Kaufpanik an den Märkten, in denen die Notenbanken das Ruder zu 100% übernommen haben. Größter Profiteur gestern die geschlachtete Goldminenbranche. Die Kursbewegungen und Schwankungsbreiten bei den Goldminen waren gestern definitiv der absolute Wahnsinn, doch das Volumen toppte alles.. Die Lizenz für radioaktives Material wurde für Burke Hollow ebenfalls erfolgreich bei der TCEQ eingereicht. Diverse Genehmigungen für die Erweiterung des ISR-Projekts Palangana (u.a. ebenso Grundwasser, Gebietsabsteckungen, Produktionsfokus etc. ), das sich ebenfalls im südlichen Teil von Texas befindet, wurden erteilt und liegen der Firma nun vor. Aufgrund der anvisierten Vergrößerung des Projekts müssen nachvollziehbar auch neue Änderungen hinsichtlich der Lizenz für radioaktives Material gestellt werden. Die Firma ist sehr erfreut Herrn Craig Wall zum Vizepräsidenten für Umwelt, Gesundheit und Sicherheit zu ernennen. Craig Wall war in den letzten drei Jahren als Umwelt-, Gesundheits- und Sicherheitsbeauftragter tätig und verfügt damit über umfassende Erfahrungen bei der Genehmigung von ISR-Projekten, behördlichen Anforderungen und Stilllegungen auf diesem Gebiet. Davor war Wall unter anderem als Umwelt-, Gesundheits- und Sicherheitsbeauftragter bei Mestena Uranium LLC, Sicherheitskoordinator der Stadt Corpus Christi und Sicherheitsexperte im M.D. Anderson Cancer Center in Houston tätig. Seit 2012 ist Wall außerdem Vorsitzender des Texas Mining and Reclamation Association Uranium Committee, das sich zum Ziel gesetzt hat, die Öffentlichkeit, Aufsichtsbehörden und Entscheidungsträger über den Nutzen und die Sicherheit der Uranförderung in Texas zu informieren. So scheint der neue Posten von genau dem richtigen Mann besetzt zu werden. Wall’s Expertisen und hinreichende Erfahrungen sollten für Uranium Energy einen großen Mehrgewinn darstellen. Folgend ein Überblick bezüglich der genauen Lokalisierung von Palangana und Burke Hollow im südlichen Teil des US-Bundesstaats Texas. Informativer Chart (Quelle v. einem lesenswerter Artikel siehe hier) als passendes Review, der aufzeigt, dass die Mutter aller Blasen wächst und wächst - und dies gilt bekanntlich für nahezu alle Volkswirtschaften auf der Erde. Interessant ist, dass die relative und absolute Verschuldung des Staats lange nicht die größten Anstiege in den letzten Jahren verzeichnete..
Hohe Staatsschulden sind ein Übel. Sie sind die Ursache der Finanz- und Wirtschaftskrise von 2008/09 sowie der seit bald fünf Jahren mehr oder minder heftig schwelenden Eurokrise. Sie sind auch der Grund, weshalb sich die Wirtschaft in vielen Ländern, vor allem in Europa, nur schleppend erholt..
Large speculators held a record number of short contracts on COMEX silver. Short interest in certain silver stocks are still low compared to last year's December bottom. Gold could drag down silver even more if gold cannot hold its support zone. 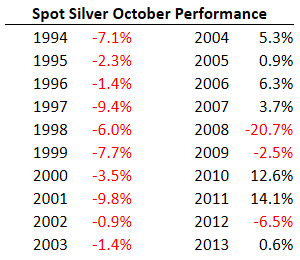 Historically, October is usually a poor month for silver. The most recent Commitments of Traders report was released on Friday and it showed that the Non-Commercial traders (i.e. large speculators such as hedge funds and managed futures funds) held a record amount of COMEX short positions. 52,104 contracts (or 260.5 million ounces) were held short as of September 30th. This was more than a 5,000 contract increase from the previous week. Prior to this week's record, the previous record was 49,012 contracts, which occurred right around the time when silver bottomed this June. As it turned out, this was not the ultimate bottom, but silver did rally nearly 15% from that point. Historically, silver (NYSEARCA:SLV) has found a bottom when short interest by the large speculators has peaked. This was true this June and also during the two silver bottoms last year in June and December. In all my years of following silver, I have discovered that the COT report is one of the most useful tools in detecting market tops and bottoms. The short interest can certainly go higher, which would push silver even lower, but the shorters are really pushing the limits here. The 260.5 million ounces that are held short is more than the 181.9 million ounces of silver inventory in the COMEX vaults. And out of that amount at COMEX, only about one-third of it is eligible for delivery. While short interest on the COMEX would indicate that silver is close to a bottom, short interest in certain silver stocks is still relatively low, which would indicate to me that perhaps there isn't enough pessimism yet in some of these silver stocks to indicate a bottom for silver and the silver stocks. For example, as of September 15th, short interest in Pan American Silver (NASDAQ:PAAS) was a little over 1.4 million shares. This is significantly lower than the 4-plus million shares that were short last December when silver bottomed. Silver Wheaton (NYSE:SLW) is another good example. Short interest was last reported to be a little over 2.8 million shares, but it was nearly 6 million last December. The same condition also applies to the short interest for Endeavour (NYSE:EXK). Ideally, a higher short interest in these silver stocks would be a better indicator that silver has bottomed. I would like to see even more short selling at the COMEX and in the silver stocks before I would feel confident that silver has found a bottom in this cycle. Also, gold's precarious position on the charts is another concern. Gold is testing a support zone in the $1180-1200 range right now. Gold double-bottomed in this range last year. If gold's support zone breaks, it could drag silver even lower. It wouldn't shock me at all if gold fell to $1000. I'm not betting on it, but I recognize that it could happen. Finally, for anyone interested in the seasonality of silver, here is the data of how silver has performed historically during the month of October. Take it for whatever you think it's worth. It could be meaningless or it might be useful.